The Book of Exodus recounts the story of Moses telling Joshua to lead his men into battle against Amalek in defense of Israel. The sign that God was with them would be Moses on a hilltop with his hands raised holding the staff of God. If his hands were to fall, then Amalek would have the advantage and Israel would be defeated. As time wore on, the arms of Moses grew strained, so Aaron and Hur provided a rock for Moses to sit on and they each supported an arm. His hands then remained steady until evening fell. Joshua defeated Amalek and Israel survived. This story reminds me of Good Friday at my home parish, where altar servers hold candles on each side of the cross while the people come forward for veneration. It is a long time to stand there, so there are many servers that switch places so the burden is lighter. Without one’s fellow servers, it would be too much for some of the less experienced and weaker ones. 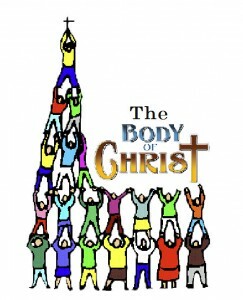 This is how it is with the Body of Christ. Without all of us playing our part and supporting one another, we are susceptible to defeat. When one of us is tired and growing weak, then our brothers and sisters in Christ need to be there to hold us up. Too often the Church, and in particular the parish community, suffers undo pain and hardship because some members of the Body choose to withhold their gifts. But if we are to be “Christ” to the world, then we all need to play our part in the Body. Together we will serve the Lord in a way that cannot only transform us, but the world in which we live. Together we are strong, even against the greatest of all contrary forces.